Though the concept was developed long before that, his first album (entitled Lagbaja) was released to national acclaim in 1993. Over the years and more albums later, the music continues to fascinate with its unique focus on a core of African drums. His music is a product of various influences ranging from tradition; Yoruba music to Jazz. Often the music purely instrumental – an interplay between traditional Yoruba percussions, drums, chants, and western instruments, especially the saxophone. When there are lyrics, they are primarily sung in Yoruba, English or a blend of the two as is colloquially spoken in Yoruba cities. Many of his songs dwell on serious social issues, while others simply entertain. Some are dance inducing while others pass serious messages in humorous ways. One thing that links all the songs together is his use of traditional African drums. Traditional Yoruba drums are the most prominent. Four families of these drums are employed in creating different grooves and moods. The dun dun/gangan family is the most prominent and at times up to five drummers combine all the various components to create the polyrhythms. The bata ensemble is led by two musicians who alternate between soft high toned driving rhythms with their omele bata, and thunderous loud talk with their mum drum – iya ilu. The general percussionist leads the sakara ensemble. The fourth family, used as the backbone of the groove is ogido, a derivative of the ancient gbedu. The ensemble of the drummers constitute the larger part of the band. Vocalists and western instrumentalists make up the rest. Lagbaja’s groovy fusion has been referred to as afrojazz, afrobeat, higher life and afropop until now that he himself has christened the music AFRICANO, alluding mostly to the central role of African drums and grooves in his music. 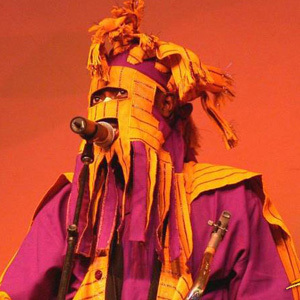 In March 1997, Lagbaja established his club, Motherlan’s in the heart of Ikeja in Lagos. Mother;an’s design is influenced by the tradition; African town or market square, where people gather under the moonlight for ceremonies and artistic events like dance, music, storytelling, wrestling stc. Now rumor has it that Lagbaja has put Motherlan’ up for sale.